This week I am going back a couple of weeks to highlight a comic from The Nib that deserves far more attention: I Went to Kentucky’s Last Abortion Clinic by Arwen Donahue. I think the comic speaks for itself, so I won’t go on too much except to admit that this highlight is quite personal to me, so it isn’t an unbiased decision to highlight it. I’d also suggest following up on this comic by looking at the Draw Out the Vote series in the list below. Sorry for the delay and a large double issue – getting busier every time I turn around! Scholarly: Pictures in health information and their pitfalls: Focus group study and systematic review. Library (Twitter): This thread is an attempt to see who has collections in libraries, to be built on for a later page. Do please share the call and let me know if you know of others! 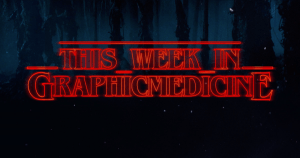 A few separate Wakelets this week, as throughout the past few weeks there have been two longer discussions about Graphic Medicine on Twitter. One about pedagogy (collected by Alice Jaggers) and one a medical librarian chat (collected by Patricia Anderson) – much thanks to you both! Following those will be the usual collection.